Get your mind out of the gutter- I'm talking about a wine rack... duh! What do you think I should do with the back of the built-in wine rack in my dining room? I didn't paint it navy when I painted the room a few weeks ago, because I really want to do something fun with it. 6. Something totally different, yet brilliant??! Obviously, the game plan is to take whatever the material is and somehow adhere it to the wall. I'm not worried about that- where there's Modge Podge, there's a way! The only fabric in the room right now are the seat cushions on our chairs. A lot of you have let me know that you think the cushions are kind of beachy, but I promise that they're more Chiang Mai Dragon than seashells. I can see either a neutral or a vibrant color accompanying this. I love option # 1! All are great....but # 1 is my favorite. I love #1 - would you mind sharing where you got it? I think #1 and #3 are nice because they are neutral, but I would really love to see something that pulled in even just a tiny bit of the navy color of the walls. I think the shower curtain would do that, but it's not neutral enough. BTW, I've been a lurker until now but I love your blog! I love the first one, but after seeing the chair cushions, #2 or #4do a great job of bringing out the bright color in the cushion fabric. Tough decision- they're all great! But those are my top three! :) Can't wait to see it all come together. Although I like #1 I think that # 2 or 4 will give it a nice pop of color and stand out. I love options 1 and 3! I think they'll compliment the chair cushions the best, but I LOVE that peony paper, too. Let's see...I think I'd have to see options for the solid neutral or bright color! I think either would be great! I like the 4th one! #1 immediately caught my eye, so I'm going to go to with my instincts and say 1! I love option 1 and 5! =] Good luck deciding. I'm terrible at making decisons! ha im dying over the title of this post - clever, clever - i lurve the 1st one! happy modge podge(ing)! #4!! Love that POP of color that goes but doesn't match. Love.Love.Love. I like option #3. It is a great neutral and will add texture. My favorite paper is the peony paper though, I love love love it! I have the same cushions in my living room! Don't you love all of the great color in them?! I like 3 - I like the texture! They're all good choices though - tough decision! I have that Greek key fabric in #1 as pillows and LOVE it. It's neutral but fresh and goes with everything. Easy on the eyes. I like #3 too! I love #4! All of them are great though! The right answer would be to pick out the colour that features the least in your cushions. However, my favourite colour to go with navy blue? Lime Green! Now there's something wild and different. I think 2 or 4 would be fun and compliment your awesome chair cushions. My vote is numbers 3 or 5. But I don't think you could go wrong with any of them. Such a fun little nook to spruce up! I really like #1 and #4! with your chair cushions the color option would look really pretty together. I totally love 2 and 4! The pop of color would be perfect with the chairs! Love 2 because it's a pop of color, with a simple design. 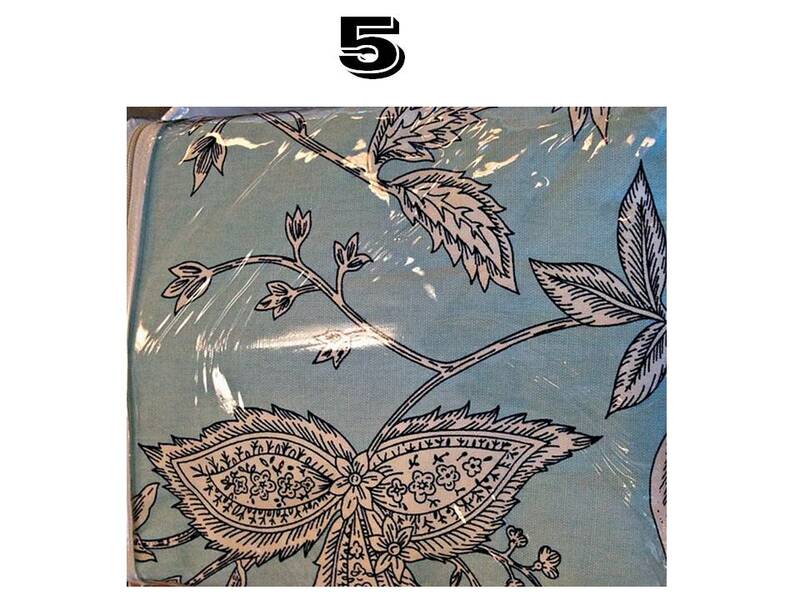 Love 5 because it relates to the walls and the fabric so well. I think they both walk the line well-- a pop of color that makes sense and draws the eye in without stealing the show. I have to say that number 3 is my favorite! It will look classic and not limit you in the rest of the room when it comes to pattern! Just my 2 cents! Okay I am torn between 1 and 3. Love them both. I really love the bright fun colors of the other options but the contrast of 1 and 3against the color of the walls is amazing! Hi Michelle, I'd go with either #2 or #3. I have the runner from Target on my diningroom table as I type and I think it would give texture but not clash with the chair cushions. #2 I think would go well too! Have fun! This is a tough one Michelle. I like the idea of bringing out the pink/red by using the #2 wrapping paper. As far as #1 goes, cross section can do no wrong...but I LOVE the way that #2 brings out the pop of red in the cushions! And I think you're right about the peony paper, it's breathtaking, but doesn't feel right for this space. The burlap thing is on the cusp of becoming way overdone (much as I love the look/price), and the shower curtain is pretty but doesn't mesh as well with the cushions as #2. First, I don't think the cushions look beachy at all. Second, while I like the pattern in number one, I'd like to see it in a bolder color pulled from the cushions. I know, I'm no help!! i like #1 and # 5!! speaking of number 1 I have been looking for this fabric everywhere. where did you find it?? Love 3 and 4!!! I'm leaning towards 3, or something similar bc I love to pull the pink out of the cushion, and love how it loooks against the navy. always twinsies my little eggo, stripes, michelle! 3 or 4! I especially like the texture of #3. I like number 1 or 3!!! Love you Michy, your doing a great job! I absolutely LOVE #1. I have it in mind to make a pillow for the family room. If you want color then I vote for #5. It ties in both the wall color and cushions. I agree that the peonies are gorgeous but perhaps not for the wine rack...I think #1 is perfect! It has some texture and interest but isn't going to compete with those cushions! I love number 3.. not to play it safe but I really the tan next to the blue walls! It's just Classic. i like number 4 the best- i think the pattern and colors coordinate perfectly with your cushions, and it's a small enough space to get away with bold pattern. i LOVE it! I adore #4...you MUST use it somewhere for something even if not for the wine rack! I am also drawn to the burlap...I am such a sucker for that stuff these days! Can't wait to see what you go with! My vote is on #3! I L.O.V.E. #4!!! It's stunning, and definitely a major pop of color. LOVE! I vote 1 for neutral or 2 for color. Can't wait to see it done! I love love love 4! I'm not a "neutral" girl though. I love pops of color - something that when you walk in the room makes you happy and excited!! I also love 5 too - still colorful but matches more. But oh man, that 4 is beeautiful! I have this fabric from World Market in my kitchen. We have white furniture and cabinets and the walls are painted the dark blue (almost navy) in the napkins and it looks great if you want to go funky. Looks like a room out of the magazine Domino. LOVE #4! The contrast of the pink against the navy is magical! I love #4! I want it too! I like the other pink too...the pop of color is great.